Dr JENNIFER OTTER BICKERDIKE is a Senior Lecturer and former American music industry executive. 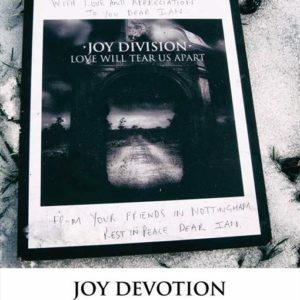 She has written and presented extensively on fandom and media, authored books about fan cultures and delivering the exhibition ‘Joy Devotion: A Year In The Life Of A Rock Shrine At The Ian Curtis Memorial Stone’. Originally from California, Jen is a former Marketing Director for Interscope Geffen A&M Records. She toured with and devised marketing and branding campaigns for major global acts including Nirvana, Pearl Jam, Rage Against the Machine, Dr Dre, Gwen Stefani, U2 and Eminem.